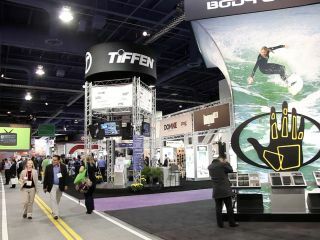 Has hosting PMA at CES 2012 killed off the photographic trade show? Has PMA been swallowed up by the giant that is CES? Anyone who walked into the hall hosting the Photo Marketing Association element of CES 2012 in Las Vegas this year back cannot have failed to have noticed the lack of attendance by most of the major photographic brands. A quick trawl of the aisles at The Venetian hotel revealed that the only camera manufacturers present were Ricoh and Pentax - and as they are now part of the same company, they occupied the same stand. The biggest stand at the show was Tamrac's and when TechRadar turned up to take a look at the latest bags it had to offer the staff weren't exactly beseiged by prospective customers. They must have looked enviously towards the bustling stands of the manufacturers who had opted to throw their lot in with CES and have a stand in the Las Vegas convention centre, just a short bus ride away. Thanks in part to the fact that electronics companies such as Panasonic, Samsung and Sony have become an increasingly important to the camera market, CES (Consumer Electronics Show) has grown in significance to the photographic industry. This show is usually held early in the new year while the Photo Marketing Association's (PMA) dedicated photographic show has typically followed a few weeks later. The close proximity of the two events has naturally lead to competion between the shows and with Photokina, a major photographic show, being held in Germany every other autumn, the PMA event has struggled for attention. This year CES hosted PMA, but it seems that most of the industry decided to have stands in the CES halls, with traditional photographic brands rubbing shoulders with electronics giants. Now that these companies have experinced the buzz of CES, it's hard to imagine that PMA will be able to entice them back to its underoccupied aisles. If PMA is set to dwindle to nothing, then perhaps Photokina will grow in stature as the major dedicated photographic trade show. There certainly seems to be quite a lot of excitement about the next show, which is set to be held in Cologne from 18th to 23rd September, with several manufacturers promising that 'big things' will be unveiled there. Panasonic, for example has said that it is likely to launch its replacement for the popular LX5 compact camera and its top-end CSC, the GH2, at the event. There are also rumours that the Japanese camera manufacturers want to boost their home show CP+ and that there are key camera announcements planned to coincide with it during 9-12th February this year. Naturally, TechRadar will be reporting on all the major camera announcements, wherever and whenever they happen.